Find a vacation home to rent in Ejstrupholm from our list of vacation rental properties. Campaya has over 16 vacation homes available in Ejstrupholm, which give you the possibility to locate a unique accommodation in Ejstrupholm which completes your check-list in search for the perfect self catering vacation apartments in Ejstrupholm or vacation villas in Ejstrupholm. Enjoy your holiday in a beautiful area situated by the Rørbæk Sø River. The beautiful and well-furnished holiday home is an ideal base to discover nature or spend time fishing. This modern cottage has a pleasant kitchen and dining area. There are three bedrooms, all equipped with double beds. This beautiful wooden cabin with a large terrace is located on a plot that has plenty of space. The house looks pleasant because of the interiors made up of wood. This comfortably furnished apartment is situated near the forest and the Lake Rørbæk Sø. The apartment comprises two floors with a bathroom downstairs. 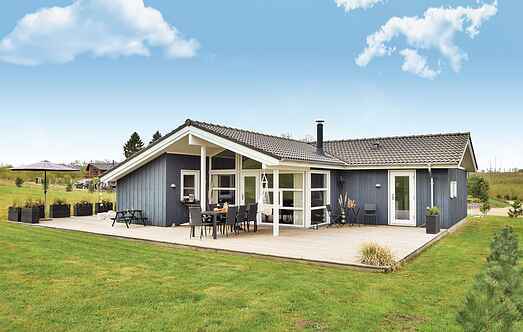 This cosy and well-equipped holiday home is located close to the Rørbæk Sø. It boasts an open-plan kitchen and living area, three comfortable bedrooms and a loft area. This cosy and well kept holiday home is situated near Lake Rørbæk and surrounded by beautiful countryside.